Family Dinner can be a great time to press pause on our lives and enjoy time talking and catching up. Sometimes, however, nit-picking and petty arguments turn “family dinner” into a not-so-pleasant experience... can you relate? Here are a few ideas to try at your table, whether it's just the two of you or a whole crew! Conversation Cards: These can be used to stimulate meaningful and enlightening conversation...you never know what you may discover about each other by asking questions you never thought to ask before. 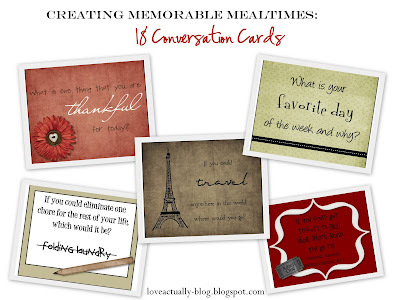 While eating dinner, take turns reading and answering the conversation cards. When dinner's over, recycle the stack for the next day! I have created a free download for you of 18 conversation cards... You gotta try these out, even if for just one night. And, of course, you can make your own with new questions once you run out. Conversation Jar: Same idea as the conversation cards, just in a jar with slips of paper. Table Talk: Perhaps you've seen something like this. (You'll have to use your imagination because I have no visual). It's a tablecloth with conversation questions on it. No need for cards... Between bites, read a question out loud for another family member to answer in a random fashion. Your local fabric store or walmart has clear or white, thick plastic on large rolls. Have them cut you a piece that will fit your table. Then, write conversation questions randomly and in different directions all over your new plastic tablecloth with a permanent marker. easy-peasy. "Just Because" Celebrations: If you are the one who makes dinner and sets the table, try, on occasion, to have a special dinner (maybe with your spouse's favorite foods). Throw on a table cloth and a candle and you'll have one bewildered spouse. When they ask what the occasion is, reply that it's the dog's birthday, the last day of winter...or something. Just to see their reaction may be worth all the extra effort! High, Low: Each person takes a turn coming up with the high and low points of their day. Imagine if you did this everyday--Even just this simple information could give you great insight on your spouse's day. Here's to your family dinners..may they be ever delicious...and engaging! These are all great ideas. Thanks for sharing them. aww..Courtney, you are my one true commenter. I can always count on you! Thank you!! Great ideas! I do the high, low thing with my kids every night at bedtime (for years now), but we call it B&W (Best & Worst). It's fun how they end up talking about things I didn't know happened even though I always ask them how their day was and what happened. Cute conversation cards! Thanks for sharing. These cards are beautiful! Love the colors and the graphics. I'm going to print them and use them during the holidays! Love your blog! Its amazing and I am very lucky one day, and our relation starts properly from a special day. One day when I went to meet her after her exam for giving a CD of a movie and she told me "is very hungry". We went to a restaurant and have good time together for around 2 hours. That was fantastic time together, can't forget ever. I just found your blog and am totally enjoying it! And these ideas are awesome. I love these ideas!!! THanks for the download and for all of the great tips. I definitely want to try them. :) Have a great day! I love how beautiful everything you make looks! I did something similar to these conversation cards, but I put them on slips of paper in an old bottle...we play "spin the bottle" for the occasional date night. :) I'd love something this pretty and simple to go with dinner, though.